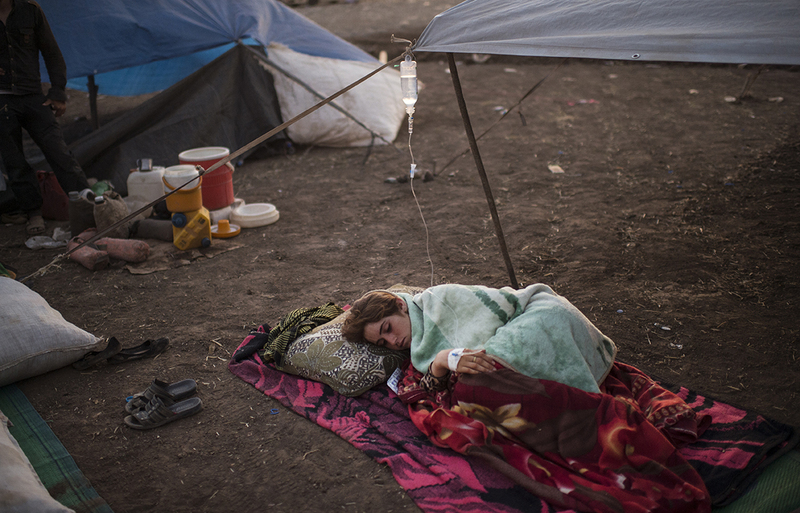 Hadia Khoyro Qasim, 13, lies with an IV after falling ill from dehydration while crossing mount Sinjar en route from her village of Til Azear to the Bahjad Kandal camp near the Iraqi border with Syria, in Northern Iraq, August 16, 2014. Since IS started making its way across Iraq, and overrunning various towns, hundreds of thousands of Iraqis have been displaced across the country. The American military is helping fight IS with targeted airstrikes on IS positions, and Peshmerga are fighting on the ground.